What are your personal Values and why? I’m part way through the Project Leadership Programme run by Cranfield University on behalf of Cabinet Office. 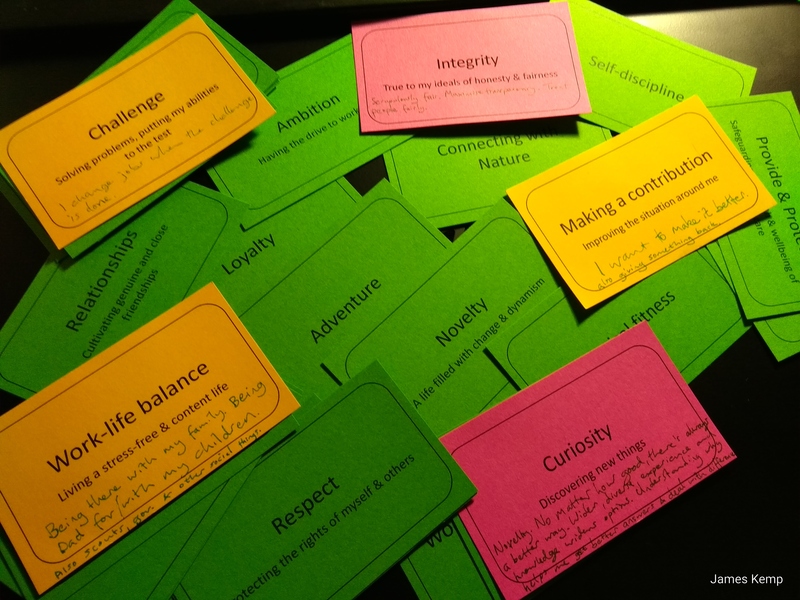 The most recent module asked us to come up with our personal values. It was an interesting exercise, because we were given a deck of cards with various values written on it. Most of these were scattered on the table, but we each got 5 cards. We took turns explaining why we were swapping something out for something closer to our values. The aim of the exercise is self-awareness of what our own values are and why. I think that if you cut me in half it would say ‘public service’ striped through like a stick of rock! You don’t need a deck of cards to work out what your own values are. You could just list them. However the most valuable bit of this exercise was the need to justify why to other people. It would also make a really good group exercise to generate a set of common values for your team. After all if you don’t have common values you are unlikely to work well together. Here’s my list of personal values. These are the drivers I use to choose my roles. They’re not in any particular order. I don’t believe that long hours are a badge of effectiveness, and I think the scientific evidence is with me on this. That said I do my best to deliver beyond my objectives, and when work calls for it I’ll go for it. However family life is important, I have a wife and two children that I enjoy being with. I also have other social interests, like scouting, and being a school governor. I think it’s the balance that leads to being better all round, and gives space to escape stress. When you re-charge can you come back more effectively. I want to treat people fairly, and be as transparent about how decisions have been made as possible. It’s also about avoiding favouritism or any form of bias. I believe that being aware of our cognitive biases is helpful, even if we can’t avoid some of them. I strongly support people I perceive have suffered from discrimination, and reject privilege when I see it in action. The major driver for making me stay in the public sector is the need to improve things for the public. I want to leave things better than I found them, and I want to improve it for as many people as I can. I’m happy to share early drafts and work in progress because it helps build strong relationships and it delivers much better outcomes. One of my proudest achievements was getting £5 off passport applications, this saved about 42 million people £5 each. While I know that not every project I will work on will necessarily be successful I take pride that overall I’ve made a huge contribution (with others) to the people in the UK (and also globally via projects on Climate Change). I crave novelty, and I hate routine. I feel that no matter how good something might be that there’s always a better way. Wider, diverse experience and knowledge builds a better range of options. Understanding why things are the way they are helps us get better answers to problems and helps us accept differences. I’m happiest where I’ve seen something interesting and I’m unravelling the potential. It’s the natural scientist in me. What happens if I do that? Does it happen consistently? What’s the underlying mechanism? I need something that challenges me, if things are easy then I lose interest rapidly. A lot of the jobs I’ve done have been new posts, there wasn’t anyone to take over from and tell me how to do it. Others were in the aftermath of a crisis, putting things back on an even keel and making them better than before (to avoid the next crisis). This entry was posted in learning, themself and tagged Cranfield University, Project Leadership Programme, Psychology, public service, themself, Values by James. Bookmark the permalink.